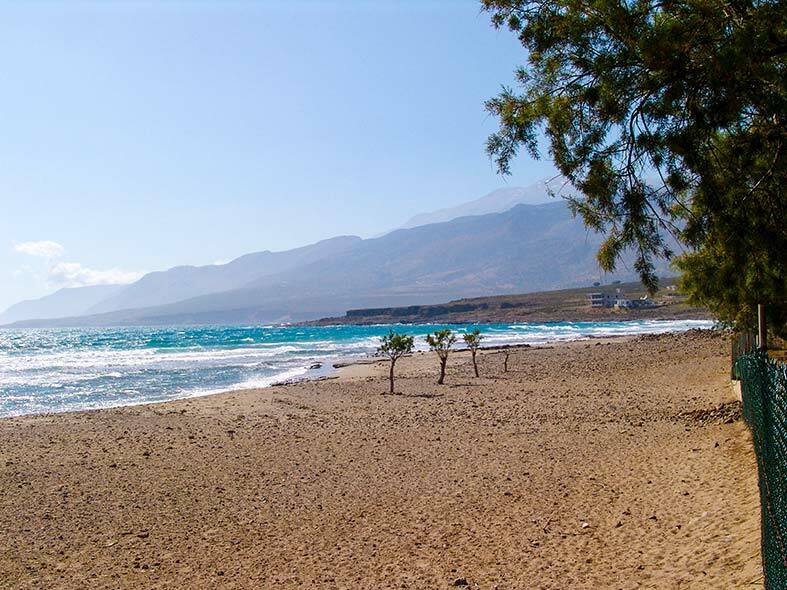 on the southwest coast of Crete island. 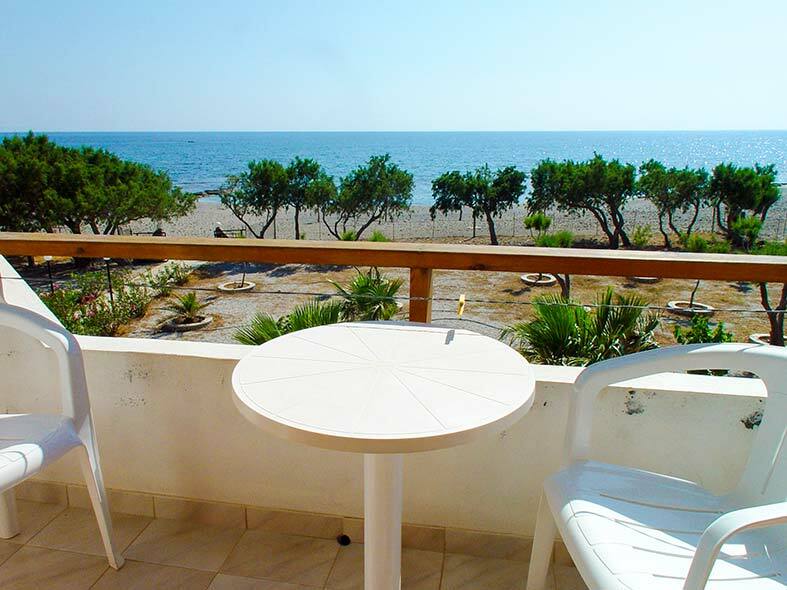 We offer for your holidays 24 self-catering studios and apartments with direct sea view. Only separated by our garden, they are directly at the beach. You can walk straight to the sea without crossing a road. All studios and apartments have balconies overlooking the garden and direct sea view, and are equipped with a refrigerator and cooking facilities. 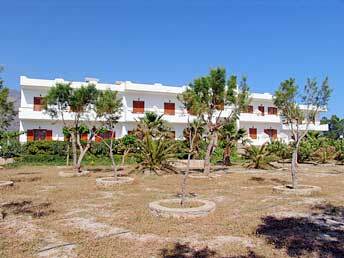 All studios and apartments have air conditioning. 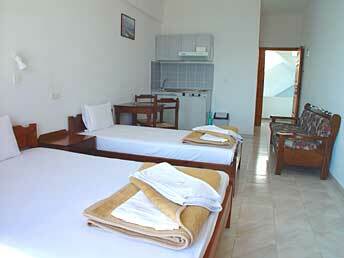 Each studio has a private bathroom, with shower, washbasin, toilet and hairdryer. 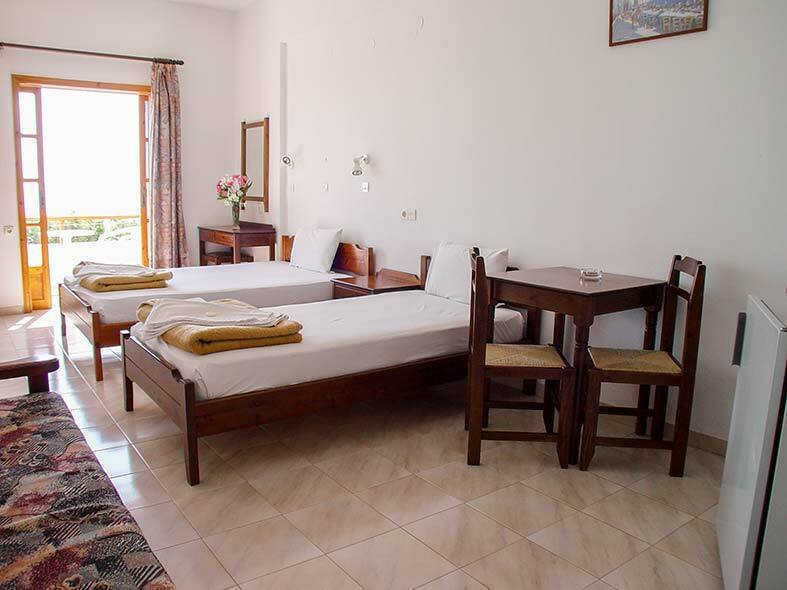 Studios Stavris contains twentyone 1-room studios for 2 to 3 people (approx. 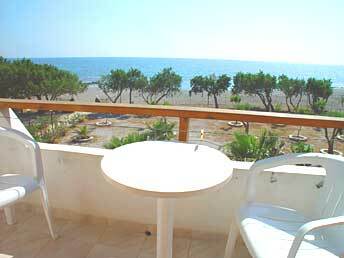 27 m²), and have 1 double and 1 single bed, a table and chairs inside, and on the balcony. There are three 2-bedrooms apartments (approx. 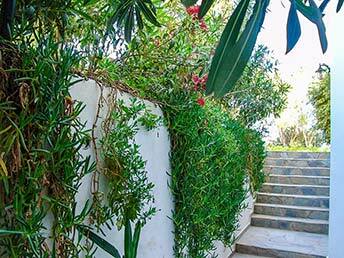 54 m²) available, with an inside door, thus accommodating families of 4- 6 people, or 2 adults and up to 4 children. We can provide a baby cot on request. 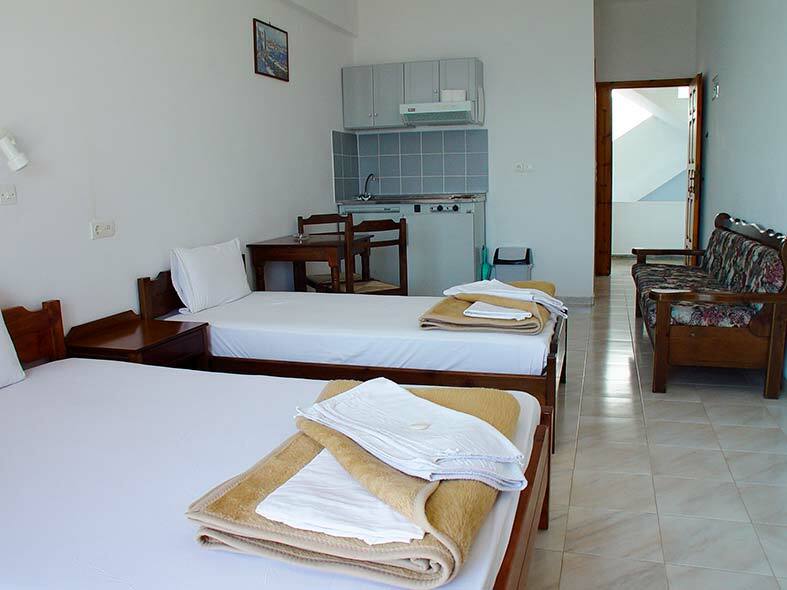 The studios are cleaned every second day, and fresh towels, blankets and sheets are supplied. You can use your own beach towel. A washing machine is available. Around the building is a nice green garden where you can sit in the shade of the trees, or umbrellas. Sun beds are available. At the reception you can get advice for your day trips. 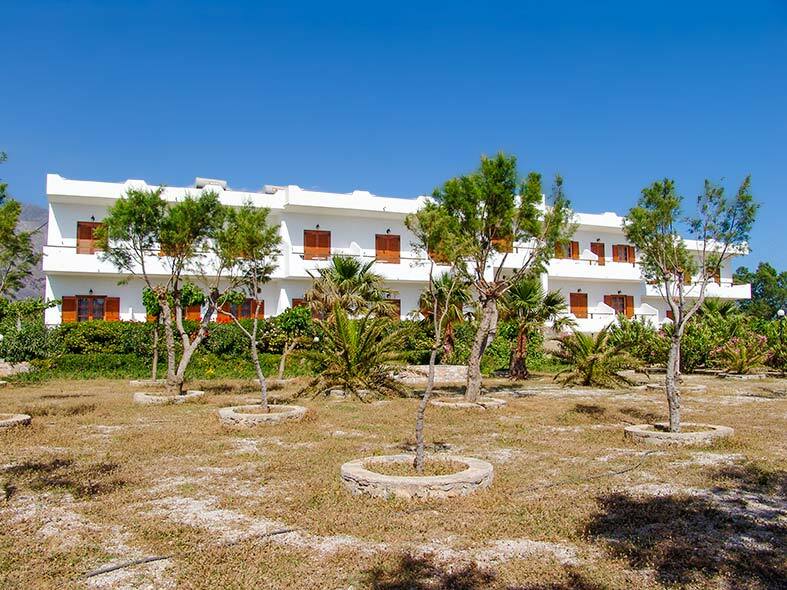 We offer free WiFi internet access for our guests. In front of the building are free parking places. Directly opposite of Studios Stavris is a mini market for your groceries: supermarket Panagiotis Kagiadakis, with butcher. 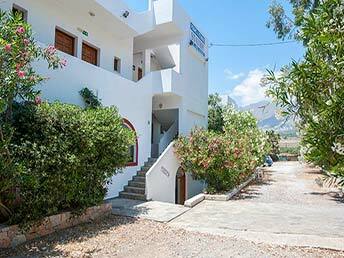 Studios Stavris has a ground floor and a first floor. There is a large cafe-bar lounge offering breakfast and refreshments, and where you can sit together at tables and chairs. You can also sit outside on our sun terrace. 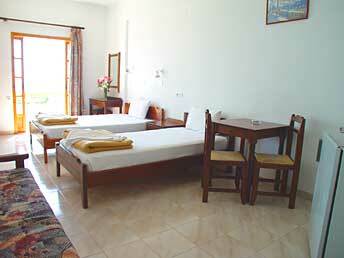 Various shops and about 20 excellent restaurants are on short distance. The building lies 50 metres from the road, so it's a safe place for children to play. 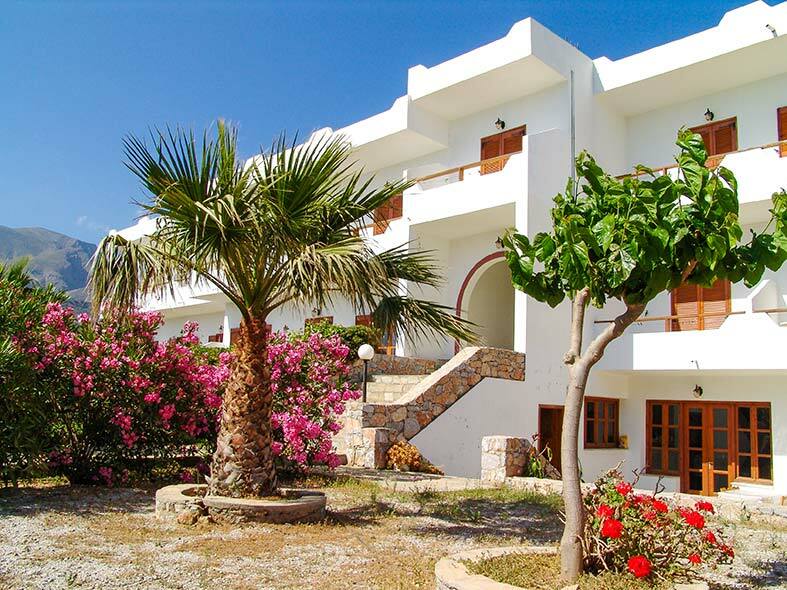 Frangokastello is a quiet, charming, peaceful and traditional village, without night clubs, discos and motorised water sports. 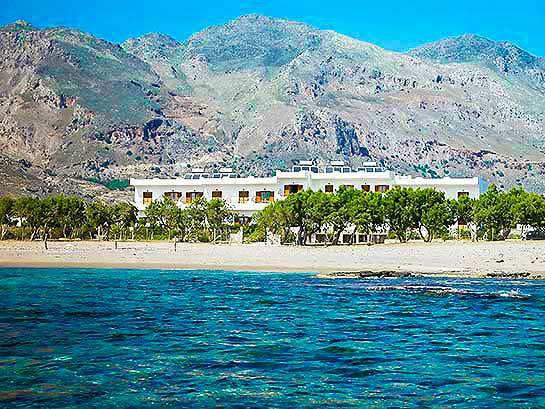 It lies along the coast in a fertile plain. 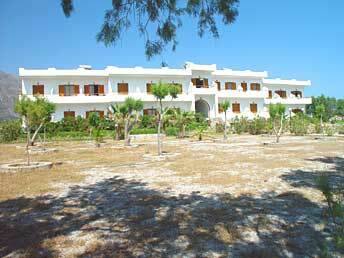 You find several other huge sandy beaches on short distance. The White Mountains are always in sight, and offer several hiking paths, and famous gorges to cross. Frangokastello took its name from the Venetian castle built there in 1371. 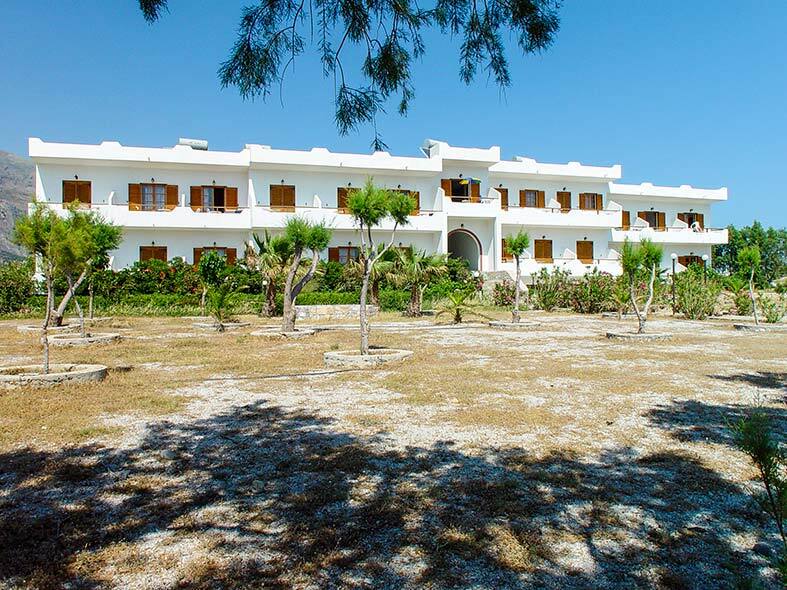 In 1828 a celebrated battle for independence was fought against the Turks at Frangokastello. Hundreds of Sfakians led by Hadzi Michali Daliani, a Greek adventurer attempting to spread the War of Independence from mainland Greece to Crete. 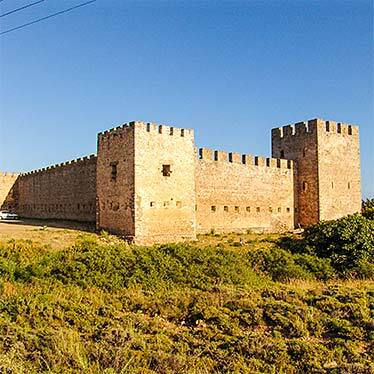 Instead of hiding in the mountains, as most rebels did in this area, he stayed in the castle with his soldiers. Unfortunately, they were massacred and their martyrdom became legendary. Locals will claim that to this day, on or around the 17th of May, the ghosts of Daliani and his army march from the castle in the soft light of dawn. They are called 'drossoulites', or dew shadows. 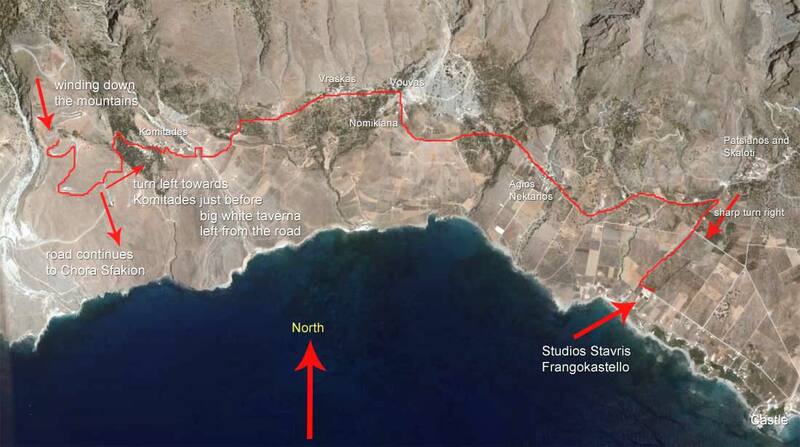 There are road connections to the west, to Chora Sfakion, and to the east and north. 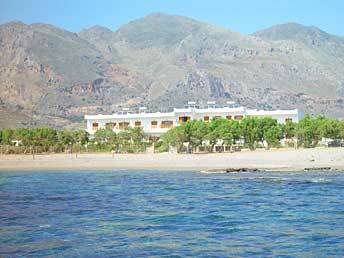 An ideal place for your sightseeing trips on our beautiful island. 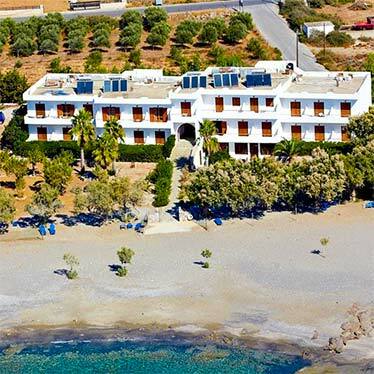 Frangokastello is 75 km from Chania airport and 150 kilometers from Heraklion airport. We can arrange a hire car for you, and deliver it at the airports, or at your accommodation. We can also arrange a taxi transfer. 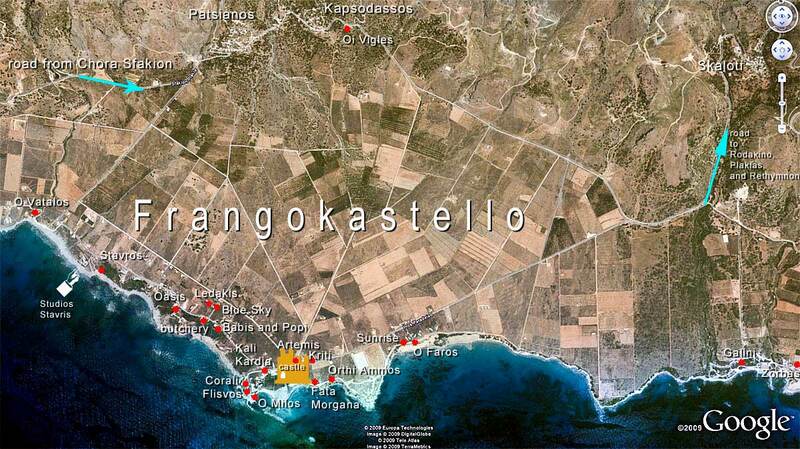 Frangokastello has about 20 restaurants and tavernas, in and around the village. There are shops, and 5 mini markets for your groceries. You can rent a motor bike or mountain bike.